The last set of teeth to erupt in a person’s mouth is the 3rd set of molars. Most people refer to them as “wisdom teeth.” Wisdom teeth typically grow slowly over time, erupting in some people at the age of 14 and in others as late as the age of 30. It can vary from person to person. Some people never develop wisdom teeth, at all. Many wisdom teeth grow in without causing an issue. Much of the time, however, wisdom teeth can do more harm than good. Do My 3rd Molars Need to be Pulled? 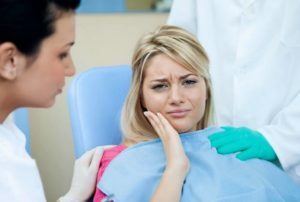 Wisdom teeth only need to be removed if they are causing irreversible damage to other teeth, compromising your oral health, or are causing you severe pain. Most of the pain caused by wisdom teeth is the result of them pushing against other teeth in the mouth or being blocked from erupting. The pain typically comes and goes in the beginning. If the pain doesn’t go away, however, you may need to have the wisdom tooth extracted. An initial consultation at our office will help you to learn about the position and health of your wisdom teeth. If it’s agreed that they should be extracted, we will discuss the process with you in detail. To help you stay as comfortable as possible, Dr. Sekhon often recommends oral sedation during your wisdom tooth treatment. Sedation with a special prescribed medication can ease your anxiety and help your appointment pass by smoothly. All treatment is provided by a general dentist. For more complex cases, we often refer our patients to a specialist for treatment. Schedule an exam with us if you are experiencing jaw pain or swelling. Don’t wait for your discomfort to get any worse! We will take a quick x-ray to evaluate your wisdom tooth eruption patterns and let you know whether or not an extraction is the right option for you.